KOREA TOWN 코리아타운 OR 한인타운 The Korean enclave in the city of Osaka, concentrated in the Ikuno Ward, and dominated by Jeju Islanders, is by far the largest in Japan, where 25% of the inhabitants are of Korean origin. Korea Town is a three hundred-meter-long shopping street situated between and east of JR Tsuruhashi and Momodani stations, with about 150 Korean food stores, Korean restaurants and ethnic clothing stores. Many of those stores and restaurants are run by Korean residents of Japan and therefore the street is filled with Korean-language signs. In recent years residents in the area have founded an NGO to give hands-on classes on how to make Korean pickles and to provide introductory Korean classes to junior high school and high school students visiting the town on school excursions, in addition to guiding them around the street. It is said that Miyuki-dori is named after Miyuki-no-mori Shrine, which was established around the 5th century on the site where the Emperor Nintoku took a rest when he visited the area to inspect people who had come from Paekche to live there (in the woods formerly located at the west end of where the street now stands). Have stayed here on multiple occasions, and whether staying one day or one month it seems to be my first choice when in Osaka. of diverse, serendipitous food stalls, restaurants, and cafes. ( Satomi, my choice for the best Okonomiyaki in Osaka is just 5 minutes walk.) There is a cafe and kitchen within the guesthouse which gives you a good place to hangout and meet some locals, or just cook your meals. I think this guesthouse is a relaxed, and comfortable place to explore Osaka from, or, as i often do, use as a staging point to explore further destinations in Japan. Hiro, the owner, is a warm, nomadic character who gives freely as an informative terminus with regards to your proclivities in japan or Korea. In your memories, you'll remember this place as Hiro's. I stayed for a little over a week in Osaka. Hiro's Guest House is where I ended up spending my nights, since I wanted cheap accommodation, and it ended up being a fantastic decision. This is the place you pick if you are not only just looking for a place to check-in and spend the night, but you also want a genuine experience that you don't get often while traveling: seeing the bustling local hotspot of restaurants and shops that is Korea Town, knowing where all of the best ramen, onsen, yakitori, okonomiyaki, bbq and more are around the neighborhood in walking distance, and the best of all, a friend who is happy to share all of this. The place is located a 15 min walk from Tsuruhashi station, It's very easy to find and the station leads directly to the subway and the local JR Osaka Loop line, which makes it all the more easier for JR Rail Pass holders. You could even take the 40 min walk to the popular Namba area of Osaka. The dormitory rooms are comfortable and equipped with curtains, and there's a tatami styled room on the third floor. You can do laundry, there's a full kitchenette for all of your culinary needs, a shared fridge, and all rooms have AC. Unlike some guest houses, this place has no curfew due to the automated password lock, so you just have to be mindful of the other guests. The downstairs lobby area is perfect for hanging out or having a drink even when the host is out. The humble nature of the area will most likely make it that you might have the entire dormitory to yourself as well. However, the focus isn't all the tangible facts. What this place offers is something much more precious. The Guest House is run solely by a humble man named Hiro. He speaks English, Korean, and Japanese well so you don't have to worry about communication. He is what would make your journey into Osaka whole. He has folders with all the local transport detailed out, a whiteboard of the nearby area around Korea Town with all of the good local restaurants highlighted with their operating hours on top of Hiro's recommendations (and cool tidbits from guests around the world), you can talk to him about your plans and he could tell you his two cents about what to do, but best of all, if you can make it back before his closing hour, you can have a nice evening talk and maybe even share a few drinks with him. I've only known him for a short while, but it's enough to make you feel that you are both friends and that you belong. If you pick this place, you won't be staying at a Guest House. 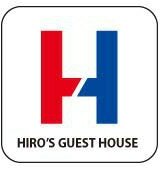 You'll be staying over at Hiro's, as a welcome guest and friend. This was my second stay at Hiro's. I stayed only a week this time, and while the layout has changed a little, I still experienced all the good things I found at Hiro's last time: comfort, safety, delicious food a hop away, interesting conversation partners, and the most hospitable guest house owner in all of Osaka. To comply with standards, a few renovations were made, but the overall feeling remains the same. I felt right at home again, despite more than a year having passed. There is now only one shower, which is really only a concern if there are many people staying (which there weren't while I was there). Even if there were many people and shower access got more difficult, Hiro has some amazing public baths and local hot springs to recommend. Honestly, it's more fun to just go to those anyways. I've gotten to know Hiro and this guest house a bit more, and I've stayed in more hotels and other forms of accommodation in Japan, and I can definitely say it is the only place I would want to stay in Osaka. All kinds of things happen when you travel, but I have a lot less to worry about by staying here: everything's just awesome, to the point that it's been hard for me to leave. Plus, having stayed in Korea Town has often become a conversation piece with other Japanese people for me. Even if you aren't able to stay here, do drop by for a drink and get something to eat in Korea Town. It's a good place to see a side of Japan that most travelers, unfortunately, don't.